While facts and pitches are well-worn tools of the online marketing trade, story is what rules. 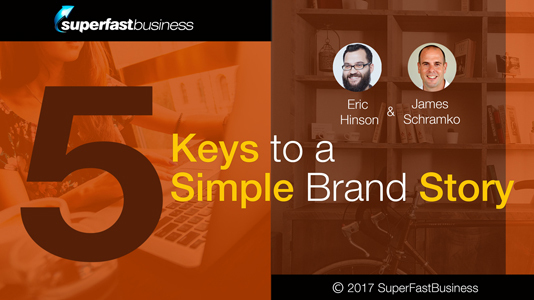 Explainify CEO Eric Hinson comes on the show with a five-point formula for storytelling that sells. 29:40 – Why let others make your video? 31:57 – Is YouTube the strategy? 40:40 – Face-to-face or virtual client encounter? James: James Schramko here. Welcome back to SuperFastBusiness. Today, we’re going to be talking about story. To do that, I brought in a story expert by the name of Eric Hinson from Explainify.com. Welcome. Eric: Thanks so much for having me, James. James: You actually reached out to me, Eric. That was somewhat bold. But I appreciated your straightup-ness. Eric: Yeah, absolutely. I’ve never been really afraid to reach out to anybody. Kind of a quick story, I reached out to Rand Fishkin of SEO Moz a few years ago, and he reached out to me. What he did was tweeted us and put us on Quora and really kind of just threw us on the map. That day that he tweeted, we had a good 200 or 300 leads for business. I’ve just kind of like moved on with that mentality of ‘let’s just keep doing this and keep talking to people.’ Honestly, most times, people reply. I think a lot of people are afraid to email people. I’m not. I think it actually works. I like a direct approach. The fact is, people who come on this show end up with lots of exposure. I don’t run this podcast purely for commercial gain off these podcasts. I’m interested in connecting with my market and continuing on this developing body of work. We’re over 500 episodes now, and we’ve covered everything, from copywriting through to getting your DNA sample done. But I tell you what, story is a recurring theme. We’ve talked to Andre Chaperon about it – how to use it in emails. We’ve covered video marketing on YouTube with Tom Breeze. We’ve had numerous copywriting experts from John Carlton through to Kevin Rogers. But something that keeps coming up, and it was in the first paragraph of the email you sent to me, you said, “Listen, the world is filled with facts and pitches. The storytellers win hands down over them all. That’s how you get more traffic to your site. That’s how you convert more. And that’s how you increase clarity.” So I think it’s worth talking about that on today’s episode. Eric: Yeah, sounds great. I think you just told people my formula, so now they’re all going to cold email you as well. James: Look, they can cold email, but the thing is, we have a filtering process. Just to save someone the effort, we have a look at their website, and we see if they’re a good fit for our audience because to me, looking after my customer is the absolute priority. If someone’s not a good fit for my audience, it doesn’t matter what kind of bestseller book they’ve done or what their story is. We actually get a lot of approaches every day. Most of them, I would say, seven out of 10 are some worn-out, hack entrepreneur who at one point went broke, then came good, and has now published a book, and their PR agent is pushing us to get them on the show. I never bring those people on the show because they’re not good for my audience. In fact, they’re kind of cringe worthy. But what I do like and appreciate is someone who gets it and connects the dots and is a good fit. Now the sorts of things that you talk about are the sorts of things that we talk about in our SuperFastBusiness membership all the time, such as how to actually uncover your story. We even had a friend of mine, Clint Paddison, came to my last live event, which was a year ago now. He shared his story of overcoming rheumatoid arthritis and building a community around that solution. And then, he got so many people drawn into that story that he stepped out of the story and he broke down his story formula for them and listed it as a framework. I’ve been using that framework in videos and emails since. It’s so powerful. It’s right at the core of what we talk about. But something that appealed to me is you mentioned you have five keys to a simple brand story. You have a book called Diamond in a Haystack: How to uncover your brand story, rise above the noise, and give your customers a reason to care. So I’d love if we could break through that five keys and figure out how we could create a story if we’re not really sure where to start. Eric: Yeah, absolutely. So Diamond in a Haystack is sort of a mashup of ‘diamond in the rough,’ which means good qualities are hidden, and ‘needle in a haystack,’ which means extremely hard to find. So you’ve all got good qualities hidden but they’re hard to find. The reason for that is the curse of knowledge. What’s really important is to keep your content and your story simple, as simple as possible. Because human attention spans are actually eight seconds, which is funny, because it’s one second less than a goldfish, which is really surprising. You’ve heard of curse of knowledge hopefully. Chip and Dan Heath talked about it in their book Made to Stick. It’s basically, when you know things that the other person doesn’t, and you’ve forgotten what it’s like to have that knowledge. Businesses are really guilty of this, myself included, ourselves, my business included. We all like to include jargon. We all like to be in the weeds. We’re in our business every single day learning the ins and outs. We manage the P&L and all these different things that we do, but there’s so much jargon filled in that because we don’t have that outsider perspective. We can’t easily take a step back. I do this for a living, and I can’t do it myself. I have to bring in consultants and friends and different things to help kind of simplify that story. The first key in the book is to keep it short and simple stupid because you need to make it make sense to a young child, let’s say a 10 year old and a grandma. If it can pass the test of what you say is understood by a young child and a grandma, then it can reach any part of your audience. So you’ve got to keep it simple. That’s how you get people to hear the details that matter. James: That is an excellent point. Gosh, I can totally relate as I’m in this phase of writing a book right now. I have an inventory of stories spanning my entire life, especially my working life. It’s been a couple of decades now. The editor that I’m working with is really forcing these stories out of me. Just like one little chapter that I was working on the other day, I was able to talk for 45 minutes just covering a general overview of some of the roles that I had and some of the lessons that I learned doing those roles. I ended up with just under 10,000 words and editing that just took hours and hours. I feel like it is hard to find the best bits of that because there’s so much content. You’re right. We’re just getting absolutely bombarded. I also really appreciate your point about how we get too familiar with the stuff and then it loses impact because having been in this market for at least a decade, people coming into it brand new get so overwhelmed and glazed over if you start using the terms that we use like CSS, or PHP, or a cron job. I think learning online marketing is like taking a new language. It’s a foreign language. That’s why meetups are so popular, because you could actually go and have dinner with a group of people who aren’t looking at you like you have three heads. I found the best remedy for that is to take up a new sport and to take a beginner’s mind and to go through that learning phase again to reconnect with what it’s like to go through something for the first time. And then I’ve built a lot more empathy with my customer. I can now relate and think, ‘Oh gosh, yeah. I’m empathizing.’ In the same way that as a parent, when you have kids and you start changing nappies and feeding these little screaming monsters, you then appreciate what your parents must have gone through with you because up until that time, you were oblivious to it. So I’ve got step one here. Keep it short and simple, and write for a child or a grandma. I’ve heard that one many times from copywriters. They say that you should be writing your sales copy for a school audience because if you don’t, you’re going to miss a good chunk of the population. Eric: Absolutely. And there are some interesting brain science out there too. Our brain burns calories, and complex facts and confusing ideas actually can shut your brain down. So many people talk about their features rather than focusing on their benefits that they actually provide. You need to ask yourself, “How does this make my customer’s life better?” So many people are saying, you go to a website, and you see on the very front part of that home page, or landing page, or whatever it be, you see, “Look at me. Look at our product. Look at these features. Look at this cool stuff – cloud connectivity, and software integrations, and Agile task management, and automation, and STKs, and all these things.” It’s great if you know that. But your customer may not know that. You’re stopping them and you’re hurting their brain. It’s not going to get to the area of the brain which is called the Broca’s area that looks and filters for things that are new, surprising and different, which helps you to retain it for the next day and for the long term. So if you can’t get past that area, you’re kind of dead in the water and just spinning your wheels and wasting time. So how much more efficient could you be if you simplify those facts? James: Gosh, that sounds like a great slogan for your business Explainify, new surprising and different. Is that really why these explainer videos work so well? Eric: Yeah. I mean, I think the explainer video has been around for a good five to seven years now. The video itself isn’t necessarily new, surprising or different. It’s the story in it. The stories, we’ve been telling them since the caveman days. And so, you have to get a solid story. That story, the empathy that you spoke about, if you can nail those things, if you can strike an emotion, whether it’s happiness, joy, sadness, crying, tears, make me mad, you strike an emotion – that’s how you win in story. James: Great. So are we up to point number two yet? Eric: Yeah, sorry. I get so excited about simplifying. James: No. I was just making sure. Maybe that was point two. But I’m with you so far. Everything you’ve said is extremely in line with the other things that we’ve heard about from sales copy. It makes sense that we’re talking about something that sells but in the video format. We get their attention, we use emotion, we have to keep it short and simple or we lose them. I remember, someone was telling me, I think it was Andre Chaperon, was telling me that all these trailers on iTunes and Hollywood trailers, they’ve got to be extremely short or they lose their audience. Like under two minutes. Eric: Yeah. Actually, there’s data by Wistia.com. They’re a professional video hosting service. After 90 seconds, they say 60 percent of your audience is already gone. I mean it depends on what it’s for. If it’s a how-to, how to repair your iPad or something like that, you’re going to be a lot more engaged in that content. But if it’s a business video especially, it’s got to be under 90 seconds, or else, it’s just not going to be effective. James: I totally agree. On the back catalog of my site, there’s lots of short videos. I looked at those Wistia stats. We’re huge fans of Wistia here. We’ve been using them for years. A big shoutout to my buddy Adam. I’ve watched the heatmaps. Everyone will stick around for a short video. If you actually let them see the player control, they can see that it’s only short. These days, I think people are abusing their customers’ attentions with sloppy live videos, Facebook live videos. They’re boring, or they’re unplanned, or they’re extremely unprofessional. Those ones I think, it’s causing us to even be more picky with what we’re going to watch. So how do you come straight out of the gate with an explainer video to show someone that it’s different than what else they could watch? Eric: Well that brings me to point two. I know you want to get there. James: [laughs] Don’t worry, I’m taking notes. I’ll get there. Eric: I’m not sure what your favorite story arc is. There’s a lot of different methodologies out there, from three acts to 12 points. But we like to talk about: the character has a problem that affects the good reality that he had before. He finds a guide, someone that’s going to sherpa him or take care of him and show him a plan. So plan is the fourth thing. And there are tools and things along the way. But in the end, there’s a goal that they’re trying to achieve. So that’s the story structure, basically, of any story, you know, Star Wars, or Cinderella, or any story you can think of. But we like to kind of take that and apply that to business. Instead of a character, it’s your customer or your prospect. So your prospect or your customer has a problem and your company is the guide. You hear this term “hero’s journey” and people think, ‘Oh, I’m the hero. I’m helping the customer.’ No, you’re not the hero. You need to be the guide. You need to be the one solving their problem, and showing them, and casting a clear vision and a solution for your customers as to why you’re going to be helpful. So it’s really important to dig in, know your mission, know your values, know why you exist. Ask yourself some of those questions. It’s kind of skipping ahead a little bit to the third point, but it’s not about you. So many people want to talk about themselves. But honestly, you’re just not that interesting, and I’m not that interesting. The fact that you spent two years engineering or four months prototyping and you use this or that kind of technology, it’s not that important. But like I said, you go to a website and there’s, ‘Look at me, look at my products, look at these cool features.’ Your customers are asking, what’s in it for me, how you help, why should I stay here, why should I sign up for your trial, why should I convert? Again, people buy with emotion and not logic. We have to speak to those pains. There’s a deep, underlying felt need in there, and you have to go in and uncover that. James: I love it. OK, so we’ve hit the Joseph Campbell hero’s journey fairly quickly, but huge distinction there, huge. I don’t think this is pointed out very often, is be the guide, not the hero. I’m pretty sure most marketers feel they have to be the hero in the hero’s journey. That’s what I was talking about before actually, the schlocky parkbench-bankrupt-creditcard-maxed-out thing. They’ve placed themselves as the hero. They were doing fine with their business, they suddenly had a turn for the nasty, bad staff, or partner embezzled them, or there was a fire, or Google shut them down. They suddenly lost all their money. And then they’re on the park bench with a maxed-out credit card. And then they got some secret material through a direct response ad that they followed and then studied the plan – that’s the guide. And then, they had a few struggles, and trials, and tribulations, and they end up going well. And now, they’re happy to share this idea with you. It’s a very well-worn story, especially from multi-speaker stage events. But gee, it’s boring. It’s like a little bit of vomit starts forming around my mouth when they start out with the bankrupt part. Eric: Yeah, you start thinking of Tony Robbins and all those other guys. James: I’m not so much talking about Tony Robbins. There’s a lot of Tony Robbins fans in our audience. Eric: I love Tony Robbins myself. I respect everything he’s done. James: I’m thinking more, some people actually fake cry and all that stuff when they’re trying to be that hero. I know several people who they’ll actually rub their calluses on their hands to trigger the old emotion of when their father used to beat them up so they can cry on stage. There’s another guy who gets around talking about car crashes every single time. Like get over it dude. It was decades ago. So how do we get out of those predictable stories? You’ve just given us a great example. We become the guide. I really resonate with that because, I don’t know about you, I don’t love getting my business advice from ex-bankrupts. I much prefer to have a guide who’s a good sherpa. I don’t want the sherpa that’s already tumbled down the hill ten times. I’d like the sherpa that’s made it up every single time. Eric: Absolutely. I think a good way to do that, and one of my favorite ways, is to talk to your customers. Survey your customers. You can do that by picking up the phone, or you can do that by using Google forms or Survey Monkey. Those kinds of things. And ask questions. Ask very specific, pointed questions. Qualitative questions. Not, “Yes or No?” There’s time and a place for questions. Like, “On a scale from one to five, how satisfied were you with the service you received?” There’s a place for that. But we want to dig in and understand their experience. How did you find out about the company? If you were to refer a friend or a colleague to my company, or to buy from us, what would you say? Digging in and kind of learning about the experience, probing, why, why, why, just like a little kid. You have to keep asking. And then ask questions about the buying process. How did you find out about us? What alternatives were you considering? What stood out to you about our company? The goal is to get clarity around the value you provide. So you can tighten up that messaging and use those things to say what your customers actually care about. So surveying is a really great way to do that. One of my favorite ways. There’s lots of patterns. You can find them there. Lots of thoughts and sentiments come up over and over again. If you see patterns and all these responses, let’s say you did 25 or 50 surveys, you start to see a pattern, you should start to use that language. It’s not cheating. It’s your customer’s language, and it’s going to resonate. James: Yeah. We’ve done a lot of work on this, especially with the ASK method by Ryan Levesque where we do a deep dive survey. It’s the name he gives it. It’s probing for the single, biggest challenge. And then you score all the results. You weight them according to the length of the responses, and you take the top percentage of them, and then you categorize them into segments. He’s a regular guest on our show and been a student of mine as well. It’s just so powerful. I’ve seen what actually listening to your customer can do. One of my favorite questions revolves around what sort of concerns did you have before you purchased? And then how did you feel about it after? And then I like to see that contrast because that’s pointing the spotlight pretty closely to the resistance, and I like to then overcome that in my copy and my messaging. James: It’s wonderful that you’re not just swinging from the trees with a huge ego. Like you were talking about before, where everyone’s telling you what went into making their product. Maybe they’ve watched too many Schlitz Beer case studies. We’re talking about the pure water from the mountains. It works for selling drinks probably. But not everything translates. Especially, sounds like you do quite a lot of stuff with software companies. I can see how the guide would be a critical role in that type of environment. Eric: Absolutely. And so many people, especially in software, you have an engineer building it. They’re putting blood, sweat and tears into it. So they’re obviously going to talk about engineering-focused things. They’re going to talk about the APIs that are integrated and all these things, which are important. There’s a place for that. Maybe further down the funnel when people are more interested. But especially at top of funnel, if someone’s coming to you for the first time, even just you at a party going to an event, how do you talk about yourself? You’ve got to simplify that and not speak the engineering language, or else, the person is going to walk away. That’s not how you get a girl. That’s not how you’re going to get customers or colleagues or anything like that. So they’d be really raving on about Keyless Go, Keyless Go. The customer doesn’t even know what that means. It’s, you keep the key in your pocket, and you walk up to the car. You can just unlock the door. It unlocks automatically. You can push a button to start the car instead of having to dredge through your pocket, pull the key out, stick it into the slot, turn the key. Now, it’s like the old days. You just push a start button. The car knows that you have the key on you somewhere via Wi-Fi. So they can talk about the feature, but the reason it’s good is you’ve now got this fantastic convenience of never having to fumble for your keys or scratch up your dashboard. It’s just so much faster to get in and out of your car. Once you have this, you’ll never go back to a regular key. Unless of course you take up something like surfing and you discover that they’re virtually impossible to bury the key in the car for you to take the little metal part in the surf, and it’s a whole new world of challenge then. Eric: [laughs] Yeah, you have to find a whole new alternative for that. James: That’s right. Damn technology. So point number two, that was something around not being selfish? Eric: It was really like kind of to know thyself. It kind of goes back to the old idiom. But basically, understanding yourself, understanding that you’re the guide and not the hero. That’s basically the key behind that one. James: Nice. What about key number three? Eric: So three was it’s not about you. Remember, it’s about the emotional connection and the customer’s pains. Those two kind of blend together pretty well. In the book, we kind of have a good transition as far as how that works. But it’s about the customer’s pains and kind of understanding the emotions. Speaking to their problems and their goals rather than the tool itself. James: Good. I like that. Transition sounds like trade talk. That means moving from one point to the other. James: I just did that in a chapter of my book. It’s like the end of one chapter says, “So what do you do in a recession? You’d get a job in debt collection of course.” And then it leads into the next chapter, which is me starting my debt collection job. Eric: Yeah. I got really excited about the transitions that I built into the book. It’s like the last paragraph is always just… it’s funny when you can nail that. And you feel creative. But absolutely, you caught me. I’m too in the weeds. I use the language myself. If you’re speaking and you’re not looking at notes or anything and you’re not getting a presentation formally, then it’s going to come out. That’s why we like to kind of be the outsider and listen to all that we can from a customer and then simplify it down to its core. Moving on I guess to point four, kind of is where I’m going, but that’s build a bridge. It’s communicating in a way that connects your businesses to people’s existing deeply-held beliefs or an existing understanding. If you picture the alphabet in front of you, ABCD, all the way to XYZ, from left to right, Z is your complete inside-out understanding of your business, of a business. So your customers know every single thing about you, and what you do, and why you’re valuable, all that. And A is where they have absolutely no clue why you do it, why they should care. So people come to your site at somewhere between A and let’s say D or E. They don’t know too much, and you have to get them further down that alphabet scale. So you’re trying to get them to J or K or L, so that they can sign up, so they can take your action that you’re asking them to take. And you can only do that by connecting them to their deeply-held beliefs so you can strike an emotional cord or something that they understand already. If I said, “The Uber for lawn care,” if you know what Uber is, that kind of takes you a little bit further down that alphabet path, and you’ll know what lawn care is. So you connect the two and you kind of move forward from A to J and you just keep adding elements like that that people connect with and kind of build that bridge to get them to a bigger, better point of understanding. James: So metaphors might be useful. Eric: Absolutely, metaphors. Uber for lawn care. It’s a great metaphor. It’s creating a quick picture so that you can make a comparison. James: Love it. That’s point four. What about key number five? So five really is kind of a wrap up. It’s tell your story in everything that you do. Your story can’t be told in text alone. Fifty-nine percent of executives would rather watch video than read text. Four times as many consumers would rather watch a video than a product about it. There’s also stats for other things like email and PDFs and infographics and mailers and leave-behinds. All this material that needs to kind of be put together. Prospects can understand your story and your product through an amass of different kinds of elements of media. Our brains process visuals so much faster than text. And so it’s video, it’s images, it’s making sure that that story resonates and kind of encompasses everything that you do, from meeting someone at a bar to going to a coffee shop and talking to somebody, to speaking at an event for Fortune 1000s, to something that you hand out. Making sure that story connects and it’s connectable to every single piece that you have, once you figure out what your simple story is. James: Right. When we look at data for things like Google advertising campaigns, we see huge conversions that are called assisted conversions. So they’ve had multiple touch points in different places such as social media search and display. They come together and we can see the customer’s been to eight different places and then they somehow bought. So wherever we are, whether it’s a podcast, a website, a PDF download, a workbooklet at our event, all of these things should have a look and feel that matches our story. So we wear our brand everywhere, right? Eric: Yeah, absolutely. Don’t just think about it from the homepage perspective. It definitely has to go everywhere. James: OK. Just a quick summary then. Let’s make sure I got these keys right. Keep it short and simple. So that means writing for a child or a grandma. Know thyself because you have to be the guide. It’s not about you, it’s about your customer’s pains. Build a bridge, help people move along it – use things like metaphors. And it’s got to be everything you do, it’s not just that one little media point. Is that about right? James: OK. So, I wonder if we’ve got time for a little bonus round of other curiosity questions. Is that OK? James: OK. So we’ve talked about simplifying the message. We’ve talked about, obviously, you’re from Explainify, what you guys do there. Seems like a lot of guys with beards, from the About page. Apart from growing amazing beards, you also do lots of explainer videos for seems like large companies. It says on the website, “Bring your big boy checkbook.” So Fortune 100s and GE and Pfizer. So obviously, you’re in a high end agency environment. Why do people get someone else to make their videos instead of making them inhouse or slapping it together on one of those cartoon sites? Why let others make your video? Eric: Well, you can’t read the label from inside the bottle. Like I said, there’s that curse of knowledge. You just know too much about yourself, and you need to take that outsider’s perspective. You need to step out. You can do that not by just hiring a video company like ours. You can hire a consultant or coaches or anything like that. You can certainly do it inhouse, but it really could end up costing you a ton of time and you could still have a clunky product that damages your brand. We often get people that chose a cheaper option and they have to come to us and sort of pay a premium on top of what they already paid to get someone else to do it to fix the problem that they have. That’s the same with any good, creative service provider, whether it’s websites or mobile app development or anything. It’s going to be the same way. You kind of get what you pay for, and you’re paying for years of experts’ training and someone that does it every single day. There’s lots of brain science, lots of research, years and decades of experience in our team rather than kind of doing it yourself. James: And they know about transitions. 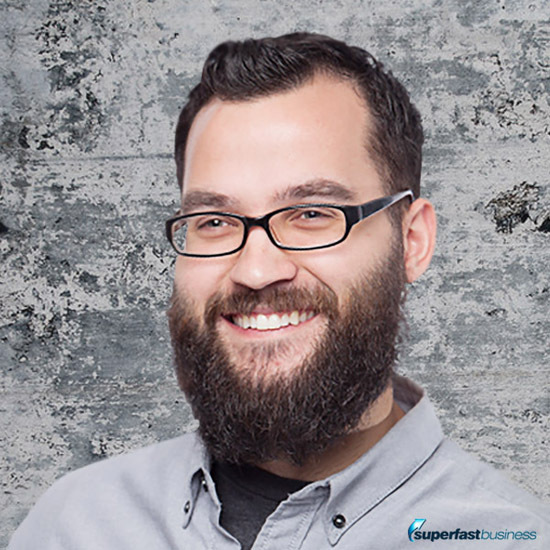 James: It blows my mind that some of my customers still try to build their own WordPress sites, like in 2017. Hello? It’s like, stop it. We’ve seen the data and we know everyone love watching videos. I saw some ridiculous statistic. Like the average American watches six hours of video a day or something like that. I’m just pulling that number from the air. But I’m sure we can research and find that videos are just overtaking everything. I know that mobiles are overtaking desktops for Google searches now. I know that ebooks sell more than physical books. Like we’re all going to our phones. Videos are great on our phones. You mentioned something to me at one point, which is that some businesses should steer clear of YouTube. Why is that? Eric: Yeah. So that’s a little misleading, because YouTube is a solid platform. If you’re going to do advertising and things like that, YouTube is going to be great. There’s not a lot of competition there, and so it’s a good place. But so many people think that YouTube is the strategy, and it’s not. It’s really the tactic. It’s more of the channel, I guess, that you’re utilizing. I can’t remember the stat, like 70 billion, some huge number of videos are uploaded every single day, right? The problem is you’re one in that mix. You’re not even one in a million. You’re like one in billions. So how’s your video going to resonate and stick with people? It just doesn’t make that much sense to me. So what I would recommend is that you use a platform like Wistia or something like that to embed the video on your site. Use the SEO keywords and all those pieces to get some of that traffic. I’m not against YouTube. You could put it on YouTube. I think that’s good. But most of the time, for business, especially B2B, especially software, people are looking for those quick facts. They’re not necessarily looking for like an auto part store to explain, ‘Here’s how to change the radiator.’ The how-tos, the educational, and then the really ridiculously, funny, comedy stuff like Squatty Potty and that kind of thing, those belong on YouTube. People are going there to be entertained. Your business is not necessarily always trying to entertain. Sometimes you do, but you’re not always after a viral hit. It’s much more effective to get customers from your video rather than getting millions of views from your video. And you’re not really guaranteed millions of views on YouTube. It’s really hard to do. James: I was going to ask you that – can you guarantee a viral video? Eric: I don’t think you can. I think those agencies that kind of sell that, they’re using influencers or they’re using a huge, paid, promotional strategy to get that seeded content out there early and kind of drive that future organic growth. But from the beginning, no. Unless you use a partner like that that has the traction already with influencers then maybe it’s possible. But it’s not that easy. James: Yeah, that’s what I suspected you might say. We’ve covered YouTube marketing from two different angles before. We’ve got Brian G Johnson talking about how to develop a YouTube channel. And I think that’s what you’re talking about there. If you’ve decided you’re going to be a YouTube marketer or a YouTube celebrity, if that is your actual strategy, then that podcast series would be helpful. If you want to just advertise on YouTube, then our Tom Breeze session, like series of podcasts, has been extremely helpful. The thing that I’ve observed with Tom Breeze, because I work with him very closely, is his customers have got their other platforms dialed in. They’re already maxed out on Facebook. They’ve already got their landing pages and their email is working great. YouTube is just another place where they can go and buy fantastic traffic and convert at ridiculous rates by sticking their videos inside other people’s videos as ads. I’d be interested in some kind of validation or case study. Can you tell me, how can you measure the success of the videos that some of your customers are making? Have you got a before and after or some interesting results that you got that might inform our listener the potential value of having a professional explainer video done? Eric: Sure. A lot of our videos our PR oriented, so it’s a lot harder to quantify those success metrics. But there’s a lot of software companies, see an average of 20 percent increase in conversions. One comes to mind is Case Complete. They’re a B2B software kind of specializing in capturing software requirements. It’s a kind of very niche audience. Most people may not understand what that means, but they work with Blue Cross, and Aflac, and Walgreens, and they’ve had thousands of unique monthly visitors, tons of traffic coming to their site. They’ve optimized everything they can like you said with Tom Breeze and his customers. They were thinking, ‘Hey, you know I’ve heard about video, and we need to try this. It might give us a competitive edge.’ Well, they were hoping to get a five percent increase, and we actually got them up to a 23 percent increase on top of funnel, homepage, sign ups to try out the product. That’s turned into tons and tons of customers. And then lots of PR-oriented stuff, like with GE, they had a really interesting approach. They had a press conference coming up in three weeks. They signed a deal to bring two and half million homes electricity throughout Egypt. So the whole country of Egypt was the story of the concept behind this video. We had to write copy and animate a video for another culture, which is a pretty delicate process. So we kind of became students of Egypt’s cultural sensitivities and traditions and etiquette. We made this video in three weeks for this press conference that the leadership, the president, everybody in Egypt, saw this video at this huge press conference when they were making this announcement. How do you quantify that? I don’t even know how they quantified it. They didn’t have any, they just said, “That was incredible. It worked out really well. It was very sensitive.” There’s the PR side of things. There’s not a good way to quantify that. And same with Panasonic. They have a really cool technology that transforms visible light into an experience. And that’s a really new thing. Like you know what QR codes are. You see a marker, you have your phone, you put your phone over the QR code. But when I say transforms visible light, what the heck does that mean? So there’s this new concept that they had to explain, and they came to us, and they said, “We don’t know how to tell the story. We don’t know how to make this make sense.” And what it is, imagine you’re in a museum and you go up to a Rembrandt. What it is, is there’s lights above the painting that are pulsating a digital code onto the painting. You pull your iphone out, you put the camera up to it, and instead of a QR code, anywhere in that light range, that camera in a matter of milliseconds, it pulls up more data and creates this sort of virtual reality where that explains different kind of tours and different things that you could do and learn more about that Rembrandt painting. James: So I’m thinking it’s like Pokemon Go where it’s adding an animal into a scene. Eric: Yeah, absolutely. But it’s based on light. James: Or a prism when you get white light on it, it can spread it into a rainbow. Eric: Absolutely. And so we had to kind of think of metaphors and different things, different ways to say that. Video is just a really great medium to explain that kind of stuff because it’s new, it’s foreign, and with animation especially, you can create any kind of world you want and tell any kind of story you want through that. James: Is there some of these videos we can embed on our post at SuperFastBusiness.com? Eric: Yeah, happy to give you those. James: So we’re going to put a post up called Explain Your Story. We’ll put some videos in that post. So if you’re interested to go and have a look at some of these, we’ll collect them there. We’ll also put your details, Eric, so that people can get in touch with you. You mentioned something about, you’ve got a couple of chapters of your book that people can grab. Eric: Yeah, absolutely. So we’re going to give away two for each chapters to your audience. Kind of help you walk through with some specific questions that take you down this journey to uncover your own brand story. Your Diamond in a Haystack, if you will. Just go to Explainify.com/SuperFastBusiness. All one word. You can pick that up for free. Also I need to tell you, once the book comes out, I’ll shoot over a promo code and you get the book for a hell of cheap. James: That’s very kind. I’m looking forward to that. I already tried to buy it as soon as I found out about it because I’m a student of these types of materials. So, just a completely side question, as an agency, because a lot of our customers are agencies, whether they’re doing PayPerClick advertising or YouTube or Facebook, do you meet your customers face-to-face or do you run virtually? Eric: We do both. I think in this day and age, it works well that way. I mean if you’re in Australia, it doesn’t make a ton of cents for us to do. Our typical process is eight to 10 weeks. It doesn’t really make a ton of cents for us to be in the same room when we can connect via Skype or Uberconference or whatever it is. We can connect and we can get all the data, and we can have as many meetings as we need, but if you’re here in the States, then it’s pretty easy for us to hop on over and meet in person. It does give you a better experience. It helps us to really spend more time and dig in with the customer and be able to ask follow-up questions quickly rather than taking a little more time if you’re international or something like that. But we do both. James: Fantastic. All right, well Eric, we usually finish off with the one best piece of summary advice. If you’ve listened to this entire podcast, you stuck with it for the last 40-something minutes, what would you say is the first action step for someone listening to this who’s got this sort of idea – Ok, I want to tell my story, I want to start the process, even if they’re going to brief an agency, they’re going to have to start thinking about it. What’s the first action step? Eric: I think it comes back to understanding the story structure – your customer has a problem and you’re the guide that’s helping your customer solve that problem. You have tools that help them achieve their goals. But you need to think about yourself as the guide and not the hero. So write down your answers to those specifics and start to understand how can you help. James: Yeah, I love it. The biggest note on my pad here, it’s “Be the guide, not the hero. That is the diamond that I’ve pulled from this episode that I’ve never heard talked about before. I think everyone in my market is trying to be the hero, and they don’t have to be the hero. It just makes so much sense to be the guide. Thank you for that. So I think the biggest takeaway is to realize that you’re not the hero in the Hero’s Journey. You are the guide. You’re there to cast a clear vision and a solution for your customers to solve that problem that they’re having. So think about, really, what is the problem that you’re solving. ?What are the struggles and pain points your target audience faces, your customer faces? What’s the status quo for solving that problem? And why are you the better solution? And think about it in terms of you not being the hero. The customer as the hero and you’re just offering a response to the problem. James: Love it. Thank you Eric Hinson, CEO, Explainify.com. It’s been a pleasure chatting with you about stories and videos and marketing in general and transitions. I love it. Be the guide, not the hero. Thank you so much for joining us. Eric: Absolutely. Thanks so much, James. I don’t have a big boy cheque book but I do need a good explainer video. Not ultra cheap but not $10,000 per minute! Any suggestions?